Tip Tuesday – Coconut Oil! Coconut oil is a very useful, multi-tasking product. There are many ways to use it in everyday scenarios to make life easier (and healthier!). It’s the perfect choice for baking, sautéing, pan-frying and more. It helps stabilize blood sugars, which as a Diabetic, is particularly useful for me! • You can stir a spoonful into your smoothie, oatmeal, soup, stew, or chili! • You can use coconut oil as a dairy-free replacement for butter or other oils in most recipes. • A dab on the inside of your nose can help alleviate allergy symptoms. • It’s also a great, natural way to soothe chapped lips, soften cheeks, remove makeup, and soften cuticles. • Slice potatoes into medallions and brush with coconut oil before slow-roasting for a crispy outer shell. • Toast sesame seeds in coconut oil over medium heat until warm and fragrant, then serve over a bed of greens with chopped avocado, shredded coconut, and orange segments. Top with your favorite light vinaigrette. Yum! • Simmer virgin coconut oil with strips of citrus rind for a sweet smelling body moisturizer. • Use as a tropical massage oil. • A tablespoon melted into a cup of hot tea will help soothe a sore throat. • Mix with salt to remove dry skin on your feet. • Whip it with a few tablespoons of peanut butter and honey and eat it as a fruit dip. It tastes like a fluffy, nutty, coconutty caramel! There are literally hundreds of uses for coconut oil, this is just a sampling of it’s uses. We have also dabbed it on Roxy when she had dry skin patches and it worked beautifully! What is your favorite use for coconut oil? As always, I welcome any suggestions, as I am a huge fan of coconut oil! Thirsty Thursday – Pina Colada Sangria! Today’s entry isn’t the most Diabetic-friendly, but, life is short and we gotta splurge a little! I modified the original recipe to add some maraschino cherries, and cherry juice to get the gorgeous ombre color effect, and some added flavor too! SO good, just be careful – it’s a little TOO good! Enjoy, and let me know what you think! Who else is a huge fan of coconut here? These are especially awesome if you are traveling – a great treat that won’t leave you feeling bloated or suffering energy crashes. I am a HUGE fan of ANYTHING strawberry flavor, and the lemon zest just helps to brighten it up for a lovely combination. Also great to bring to a party when you want to have a healthier indulgence! Um… this even SOUNDS delicious! Anything with coconut flavors is right up my alley, how about you? Who would give this a try? I don’t think I have ever met a steak I didn’t like, especially one that has been grilled… YUM! Pssst… wanna know a secret? I LOVE coconut. Like hands down, if I could pick one flavor, one scent, one taste, this would be it. Coconut has this way of transporting me (if only in my mind!) to a tropical island. It’s like instantly, it transport’s me to a beach-bum state of mind. It’s super versatile, too. I am a HUGE fan of using it in my Shakeology – coconut water, coconut milk, coconut extract… YUM! What’s your stance on coconut? Summer only? Year round? Do you like French Toast? I SO love it… a little too much! I know its not the healthiest but it is so good! 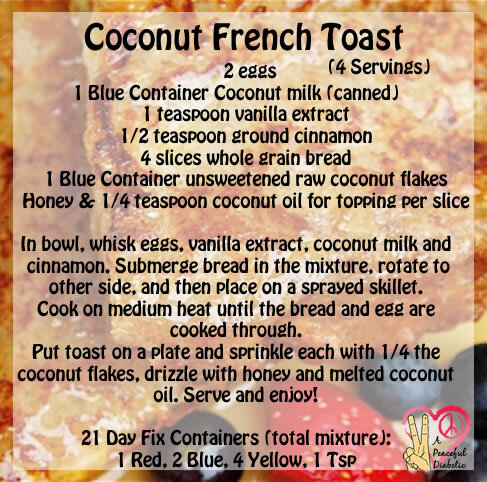 I’d never had coconut french toast before but I figured it was worth a try because I LOVE anything coconut, and it’s delicious! So simple to make, but so tasty! A fellow Beachbody coach turned me on to this stuff (knowing my penchant for anything even remotely coconutty!) and I was pretty much hooked instantly. Considering all the benefits, I don’t see that as a bad thing! Who knew?! Have you ever tried Coconut Flower Nectar?